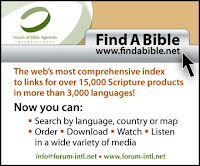 The “Find A Bible” website provides the most comprehensive and current database of Bibles and portions in more than 3,000 majority and minority languages available. Many Scripture products noted on the site have never before been listed on the web. People now have a single place to search, download, view, or listen to these Bibles through links to Forum member agency websites. As the global community continues to increase its dependency on the Internet, the public expects to find information about Scripture availability online. If a Google search for a Bible in a given language turns up nothing, people will assume it does not exist. Member agencies represent a wide spectrum of Christian heritage and mission. They span more than 120 countries and are headquartered in five different nations. Their workers represent thousands of dedicated believers committed to seeing the life changing Word impacting all peoples. Many agencies have a long history of service, the oldest founded nearly two hundred years ago. Others are fledging, finding their opportunities for worldwide partnership and service. God's Word is for every tribe, people, and tongue: “Faith Comes By Hearing” is committed to reaching the nations with the Word of God in audio, offering the Bible in a format that will connect with the world's 50% illiterate population. To accomplish this enormous task, the Lord has assembled a group of committed leaders and dedicated servants of His Word to develop into a reality the vision of bringing His church together and making disciples. Armenian, Batak_Toba, Bulgarian, Cantonese, Croatian, Czech, Darlong, English_CEV, English_KJV, English_NIV, English_NKJV, English_TEV, Falamchin,Georgian, Hakka, Hindi, Hokkien, Ilocano Indonesian, Italian, Javanese, Kannada, Khmer, Kurmanji, Latvian, Malayalam, Malayalan, Mandarin_Union, Manipur, Marathi, Nuer, Oriya, Oromo, Polish, Romanian, Russian, Sinhala, Slovak, Spanish, Sudanese1, Sundanese, Tagalog, Tamil, Telugu, Tibetan-Amdo-Colloquial, Tibetan-Amdo, Ukranian, Uzbek, Vietnamese, and Wyanwar-Burmese.